Big Red’s Guaranteed Clean is the only company in Omaha that provides 5 different methods of carpet cleaning. We don’t have a one method fits all model like other companies. At Guaranteed Clean, we pick the carpet cleaning method that best fits your situation! 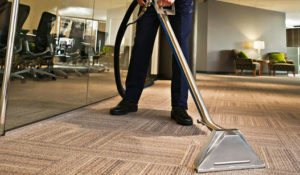 We want to give you the best way to safely and successfully clean any type of carpet. Shampooing – In this process, the cleaning solution is showered onto the carpet through several openings in a circular brush. The rotary action of the brush whips the detergent into a foam and provides agitation or rubbing action on the carpet. This suspends the soil, and the wet/dry vacuuming that follows removes it. Bonnet Cleaning – This method employs a rotary floor machine with a round absorbent pad attached. Detergent is sprayed directly onto the carpet. As the machine is operated, the pad rotates on the carpet removing the soil as it is absorbed into the pad. Foam Cleaning – This method uses a machine that generates foam, which is agitated into the carpet by brushes. The foam emulsifies the soil and is then removed by an extraction-vacuum pickup. Dry (Absorbent Compound) Cleaning – This method uses an absorbent dry compound (containing solvents and detergents) that is sprinkled onto the carpet and worked into the pile manually or with a machine fitted with a brush. Soils are absorbed into the compound that is then allowed to dry. It is then vacuumed from the carpet removing the soil suspended by the compound. Steam Cleaning – This is the most commonly used method for carpet cleaning today. Although it is called steam cleaning it really refers to hot water extraction. Cleaning compounds are sprayed onto the carpet to emulsify the soils and then hot water is flushed through the carpet to rinse out the soil laden solution. Green Cleaning – We offer green cleaning products to suit any cleaning need – all at no extra charge! Regardless of the carpet cleaning method we utilize, we employ several unique procedures that insure each client will Love Our Service! We will wear booties in your home, we will use corner guards and other safety equipment to help prevent damage to your home during the cleaning process. Check out our coupons page for our latest deals on Carpet Cleaning and other services! Also have rugs that need cleaning? We do that too! Contact us today to learn about all our services.